Following the GP’s and seeing that Standard is now becoming a more stable format, I have been waiting for a good chance to look at the success of Mono-Blue Tempo / Aggro which came second by Gabriel Nassif. Is this the deck that will drag me as a player back into Standard? This is a super budget option for the deck and would be a great place to start, as Standard can be an expensive format to jump into. The deck doesn’t run any fancy lands and the only notably expensive card which is needed is Siren Stormtamer (an Uncommon at that!). This deck has great evasion with flying creatures, a lot of protection with Dive Down, Spell Piece and Wizard’s Retort which becomes a counterspell as Merfolk Trickster and Siren Stormtamer are wizards. 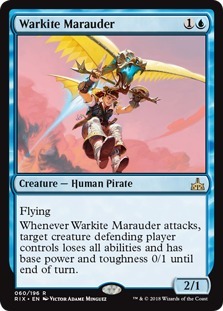 Warkite Marauder is an odd one as you can’t abuse the effect of the card when it attacks after it has made a creature 0/1 unless, of course, it has Reach or its a flier itself. The biggest hitting card which will close out the game fast is the Tempest Djinn which gets +1/0 for each island you control, and as it is mono-blue this becomes a beating stick, oh flying of course. With the power of blue, you always have the ability of drawing cards which two cards within the deck let you. Opt is the simple Scry 1, Draw 1 at blue mana and instant speed makes it easier to keep mana open for the whole of their turn to make them think you have a counterspell and then just Opt at End step. The other one is different as it is an Enchantment called Curious Obsession which gives +1/+1 and when it deals combat damage to a player, you may draw a card. Keeping your hand full with these two cards and making sure you have the right answer. Mist-cloaked Herald is an unblockable creature so powering it up with Curious Obsession just gives you the power to hit them for 2 freely (Unless they’re mean and kill it) and then draw your card. Oddball cards being the one Sleep which can lock their team down for a turn so you can finish the game or to delay them by one turn, so a cheeky one is worth it. Essence Scatter maybe when you’re on the play and there go turn 2 Steel-Leaf Champion your able to counter it but also on turn 2 you can flash in Merfolk Trickster if there have done nothing to apply pressure. Sideboard cards there are a couple of one-ofs like Chemists Insight which is for the longer more grinding games which you can see yourself drawing the land late game just able to discard it. Diamond Mare I am surprised there is not more of them for the Mono-Red matchup as it seems to be pretty tough(Also beat this deck in the finals) but there just a lonely one. Disdainful Stroke this is a good answer to Hero of Dominaria, Finality, Vivien Reid, Vraska, Golgari Queen, Ravenous Chupacabra, Crackling Drake, Ral, Izzet Viceroy, Shalai, Voice of Plenty, Lyra Dawnbringer and many more cards. 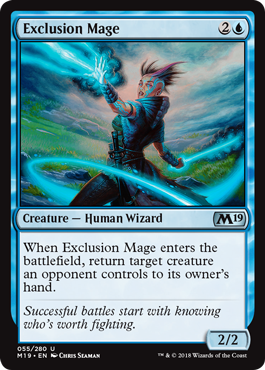 There are couple more cards which look to be more focused on creature matchups, with one more Essence Scatter, Entrancing Melody to take control of a creature and then 4 Exclusion Mage which seems to have a place in this deck with also being a wizard. 1 Negate for control help, Selective Snare when you are unsure if tribal decks will appear out of nowhere. Sential totem thinking graveyard decks will be big but this hits a lot of the G/B decks in Standard. Another Sleep and 1 more Warkite Marauder just help in matchups where creatures can get in the way. Breaking down this deck is really cool and I really hope to see more of those Mono-Blue decks appear in the top 8 in Standard as I feel mono-blue decks were always my strongest decks in standard and modern. Of course even some decent budget options in general!